Dave Sim and Gerhard Wizard #17 Cerebus Illustration Original Art (1993). Cerebus gets comic-graded in this cool piece, illustrated by series creator Dave Sim with gorgeous backgrounds and hand coloring by Gerhard. This was used to illustrate the feature "A Boy and his Aardvark: The Dave Sim Interview" on page 56 of the issue. The art is mixed media on paper, which is taped to a piece of illustration board. 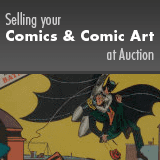 The image area measures approximately 8" x 16.75", and is in Excellent condition. From the Shamus Modern Masterworks Collection.